Each domino tile has two numbers, one on each end, which represent the roll of a pair of dice. 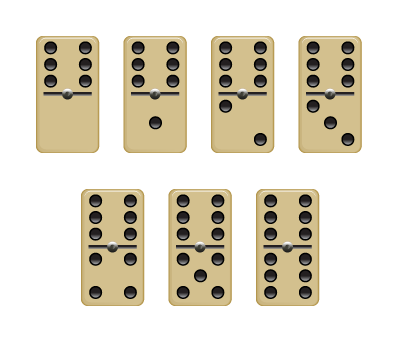 In a standard set of dominoes, the numbers range from 0 (blank) to 6. There are twenty-eight unique tiles in a set, one for every possible number combination. This standard set is called a “double-6” because the double-6 tile is the highest. 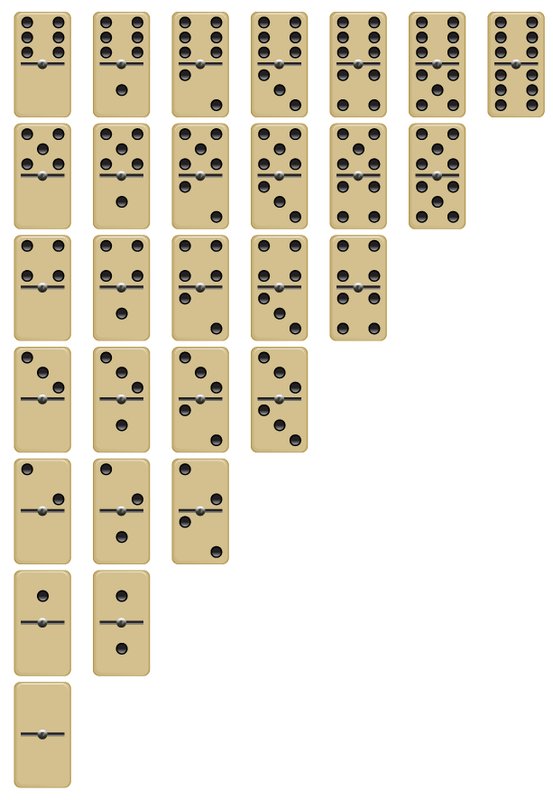 Dominoes are named according to the number of dots (or pips) they have on their front. The lower number of the two is always listed first. For example, a tile with a 4 on one end and a 6 on the other would be referred to as a “4-6”. If a tile has a pair of the same numbers on it, it’s called a double. Dominoes are commonly ranked in order of how many pips they have. The higher the number of pips a tile has, the “heavier” it is. The double-6 tile is the “heaviest” tile, while the double-blank is the “lightest” tile. A suit is a group of tiles that all have a matching end with the same number on it. There are 7 suits, each containing 7 tiles. Pictured, for example, is the 6’s suit. With the exception of doubles, each tile belongs to two suits. To win, be the first player to score 100 points. Score points by playing all of the tiles in your hand during a series of rounds. This is called a “domino.” At the end of each round, the winner will be awarded the number of points still remaining in his opponent’s hand. Each player starts the hand by drawing 7 random tiles. The excess tiles are placed in the draw pile (also called the “boneyard”) so they can be drawn from when necessary throughout the game. Once each player has drawn his or her hand, the player who holds the highest double begins play. If no player has the double-6, then the double-5 is played and so on. During their turn, each player attempts to play a tile from their hand by matching the numbers they have to one of the open tiles played on the table. An open tile is considered an end that has no other tile connected to it. Play your tile by clicking the end with the matching number and it will automatically be placed against the corresponding number, continuing the unbroken chain of tiles with two open ends. For example, in this scenario the double-5 was played first. At that point, 5 is the only number open. The next player places the 3-5 tile on the right, making the open ends to match 3 and 5. During the next turn, the 1-5 tile is played to the left. Only a tile containing a 1 or a 3 can be played now. Throughout the game, playable tiles are marked black, while tiles that do not match are marked in red. If you cannot play any of the tiles in your hand, you must automatically draw from the boneyard until you draw a tile that you can play. When you draw a tile you can play, lay it down immediately. There is no need to skip your turn. If there are no more tiles in the boneyard, you must pass and wait until the next turn to try to play from your hand. If you cannot, you must pass again. 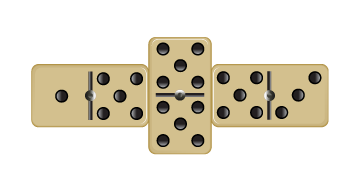 Throughout the game, dominoes may eventually be placed on an end at a right angle to form a corner. This is done to save space, but does not affect game play. 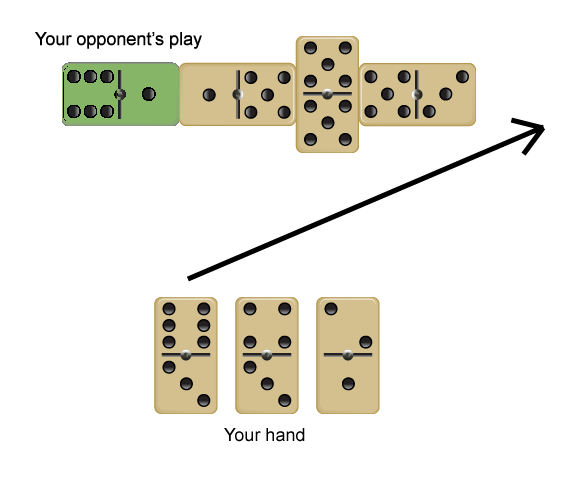 A player has played all of the tiles in their hand (“dominos”) and is automatically declared the winner. The boneyard is empty and all players have consecutively passed, unable to play any tiles remaining in their hand. This is called a blocked game. In this case, both players should tally the points remaining in their hands and the player with the lowest points is the winner. If the round ends because someone has played all of their tiles, tally the number of pips on their opponent’s unplayed tiles and award those points to the winner. If the round ended because of a block, each player should tally the pips remaining in their hand and award those points to the winner. Doubles are counted as two, meaning a 5-5 equals 10 points. Double blanks are equal to 0. After multiple rounds, the first player to reach 100 points is declared the winner. Increase your playing options by keeping as many different numbers in your hand as you can. It might not always be possible, but when it is, the variation will allow you flexibility and more opportunities to play. Doubles are twice as hard to play because they contain only one number instead of two. Always play doubles at the first opportunity you can. During the game, try to play the heavier tiles first. This is especially important towards the end of a game. If your opponent plays all the tiles in their hand first, you want to have the fewest number of pips in you hand as possible. The more pips you have in your hand, the more points they’ll earn. When possible, use your turn to make both ends of the chain have the same number. This can be a strong defensive move that limits your opponent’s opportunities to play a tile from their hand. For example, in this scenario your opponent has just played the 1-6 tile. In your hand you hold the 3-6 tile. Playing that tile to the right of the chain makes both ends 6, forcing your opponent to have another 6 in his hand to play. If he does not, he’ll have to draw tiles from the boneyard until he pulls a 6. Surveying the chain to count how many tiles of suit have been played can be helpful. Remember that there are 7 tiles in every suit. For instance, if you count five blank ends in the chain, this means there are only two remaining blanks either in your hand, in your opponent’s hand, or still in the boneyard. If you were to have both blanks in your hand, it would be ideal to play one as soon as possible. With one end of the chain ending in a number your opponent does not have, they are forced to either match the number on the other end or draw from the boneyard until they can.